HIGHLANDS  The Chamber of Commerce held their awards ceremony and installation of board members last Thursday night, at the Monument Inn. Over 100 members of the community joined in the festivities. It was a big night for one member, Jim Wadzinski. Not only was he the MC of the event, but he also was awarded the prestigious Terry Davis Community Service Award, and his employer, Community Toyota, received the Business of the Year Award, accepted by owner Roger Elswick. The evening had a new feature, a keynote speaker. Chad Burke, CEO of the Economic Alliance, representing 160 companies in the ship channel area, spoke about the economic strengths of the region, and some of the problems and promise to come. 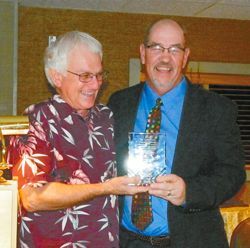 The top award, for unselfish community service, is known as the Terry Davis Award and went to Chamber president Wadzinski. It was presented by previous winner Weston Cotten. Other awards that were given: Outstanding Business, Community Toyoto/Honda/Kia; Outstanding Constables Deputy, David Franklin; Outstanding Sheriffs Deputy, Greg Campbell; Outstanding Firefighter, Kyle Little; and Citizen of the Year Betty Brewer. The new board was sworn in by Judge Don Coffey, with his usual mix of humor and seriousness. Retiring board president Jim Wadzinski gave a motivational talk about his last 2 years in office. He urged the members to invest in ourselves and find something worthwhile to give time to. GALVESTON – A young couple from Crosby were celebrating Mardi Gras last Sunday morning, but it ended in a tragic accident in which their vehicle exploded. Kendal Reed, 19, was driving a PT Cruiser that drifted across the opposite lanes of traffic before smashing into a concrete pole near 4600 Seawall Boulevard about 3 a.m. Witnesses and police tried to pull them from their S.U.V. but it burst into flames. Sgt. Joshua Schirard of the Galveston Police Department indicated the response time was brief for police and said witnesses were able to pull Reed’s girlfriend from the passenger side of the crushed S.U.V. before flames erupted. Officers tried to free Reed from the driver’s seat by using crowbars and sledge hammers to remove the door as they fought flames with extinguishers. 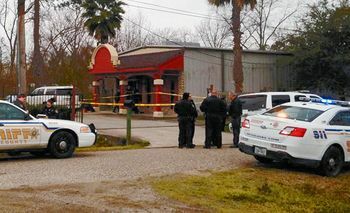 Sara Santana, 20, was taken to University of Texas Medical Branch at Galveston but had “sustained massive trauma,” police said, and was pronounced dead shortly after arriving. The couple is survived by a 7 month old boy named Bentley. Reed played football in junior high and at HISD’s Sterling High School. Sergeant Schirard said it was unknown if alcohol played any role in the accident. 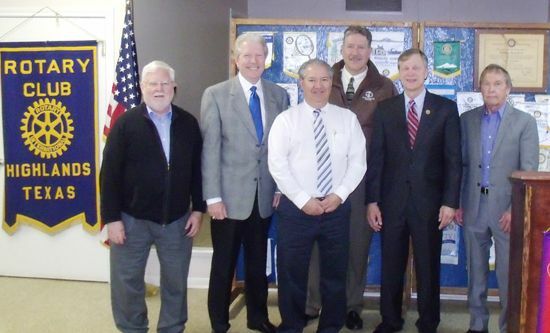 Congressman Brian Babin, the new Representative for House District 36, was a guest of the Highlands Rotary Club at its Tuesday luncheon this week. He decried the nations drift away from the values esconced by the drafters of the Constitution. He is described as a conservative Republican, but not a Tea Party member, he says. He hopes his work will help to restore some of those missing values, in ethics and morals. Babin was educated at Lamar University in Beaumont, and the University of Texas Dental School. He has been a practicing dentist since 1976, but is now retired. He also served in the United States Air Force. Babin has been married 42 years, and has five children, with distinguished careers. One son was a Navy SEAL, and one daughter-in-law, Jenna Lee, is a TV news person, on Fox News. He maintains five offices to serve his constituency, including Washington DC and his hometown of Woodville, Texas. His nearest office to this area is in Deer Park. Babin was elected in 2014 after a Republican primary race against 12 opponents, and a run-off in which he won 58% of the vote. There were so many candidates, because this was a seat originally held by Steve Stockman, who declined to run for Congress in favor of an attempt at the Senate. 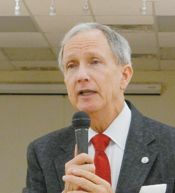 Prior to running for Congress, Babin held office in Woodville on the school board, on city council, and as Mayor. One of my top priorities is to build a healthy economy that creates opportunities for all Americans. As a small businessman, mayor, and member of the local school board, Ive seen firsthand how Washingtons inefficient, ineffective and unaccountable regulations stand in the way of this goal. Im advocating common sense reforms to rein in these agencies so that job creators can put Americans to work. On specific issues, Babin feels that the federal EPA has too many regulations that hurt our local refineries; that the ACA or Affordable Care Act is wrong, and needs repealed; and favors the Keystone XL pipeline, and says studies prove it is not bad for the environment, and would create 42,000 construction jobs. He said the XL bills has passed both houses of Congress, and it will remain to be seen whether Obama will veto it. If so, Congress would need two-thirds majority to override. 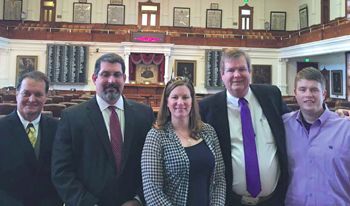 He also favors more Border security, saying this is important because there is already indications of terrorists crossing the borders into the U.S.
AUSTIN  Crosbys Scott Stephens has set in motion the passage of legislation that will require an electrocardiogram heart test for student athletes. Last week when Sylvester Turner, D-139th, Wayne Smith R.-128th, and Dan Huberty R.-127th filed House Bills 677, 767 and 799 respectively no Senate bill had been filed but Tuesday State Senator Juan Chuy Hinojosa filed the first of two known Senate Bills as State Senator Sylvia Garcia has decided to do also this week. Locally, many know that Cody Setphens died on May 6, 2012 a day before graduation of sudden cardiac death. Many know that Huffman ISD required the test but Crosby ISD did not back then. Sudden cardiac death is the leading cause of death among school-age athletes. Student athletes are 4.5 times more likely to die from sudden cardiac death than students not participating in competitive sports. Student athletes in Texas are currently required to receive a physical in order to participate in UIL activities, the traditional physical does not sufficiently detect the underlying cardiac abnormalities that can lead to sudden cardiac death. An ECG provides for greater detection of cardiovascular diseases that predispose athletes to sudden cardiac death. I ask people all the time Do you want to go to your doctor and say Give me the same physical you gave my dad 35 years ago?, and thats really what were doing for our kids, said Stephen. If passed, Texas would become the first state in the nation to require student athletes to undergo electrocardiogram testing. The test would cost $15 each with agreements that Setphens initiated with healthcare providers and hospitals. CROSBY  The 4th annual, Bras for the Cause held Saturday, Feb. 7, at the David H. McNerney American Legion Hall #658 raised over $151,000 to benefit families fighting cancer by paying qualifying patients third party bills. 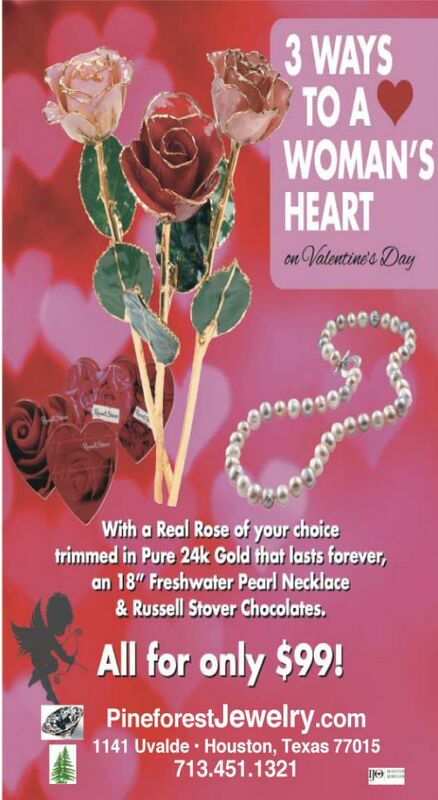 Proceeds benefit the Pink Heals Endowment and the American Cancer Society. 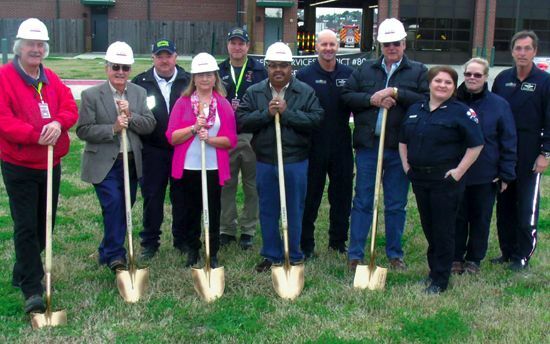 The Pink Heals Patient Assistance Fund was established at Houston Methodist San Jacinto Hospital Cancer Center in Jan. 2011 after hosting the inaugural Baytown Pink Heals event on Oct. 8, 2010 which reported proceeds over $18,000. 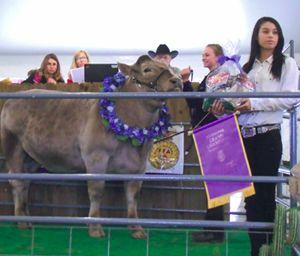 Each year after, the event continued to grow in success and with the help of the Crosby Fair & Rodeo Association the reported proceeds for 2014 were $151,000, the amount raise this year by last Saturday alone. Although complete tabulation isnt completed. Jacob Schexnayder dressed as a sultry SWAT Police Officer. His bra sold for $36,000 split between Oilwell Tubular, the Schexnayder Family and the Certifab/Lewis family as depicted on page 10 of this issue. 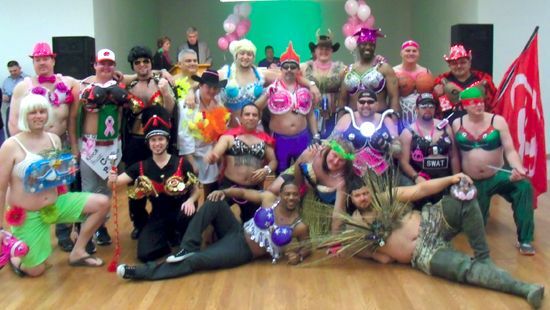 Twenty courageous local celebrities paraded the bras before a capacity crowd inside the American Legion Hall. Don Nelson, of Channel 13 ABC News anchor was MC. Elbert De La Cruz, was DJ. Jennifer Loggins was event photographer. Catering was done by Demeris. For those that missed out helping with this effort Crosby Fair & Rodeos Tough Enough Committee will have other opportunities to benefit the Cause this year. HIGHLANDS  The 40th Annual Chili Feast and Raffle was a rousing success, according to chairman Larry White. The event was held last Saturday, at the St. Judes Catholic Church on Main Street in Highlands. White reported that the raffle was completely sold out, with 700 tickets sold at $100 each, for a chance to win one of 16 prizes. The top prize was a new vehicle, the winners choice of a 2015 Ford Mustang, or a 2015 Ford F-150 supercab pickup truck. White noted that this truck was the new model with aluminum body, and has been in high demand. Baytown Ford has only a few, and provided one for the raffle. The winner of the top prize was Gary Clemmons of Baytown. The winning ticket was sold to him by Rotarian Teresa Martin. Rotary Chili Feast chair Larry White, and president Raymond Gonzalez, announced that the event had been quite successful, netting about $85,000 which will be used for community projects through the year. The net amount is about $20,000 more than previous years, indicating the amount of support from the community. Several hundred persons attended the event, which is always enjoyed for its good chili, renewing old friendships, and the thrill of the auctions and raffle draw. Rotarians and local businesses sold 700 tickets to the raffle. Betty Brewer was the high ticket seller, with 143 sold. Auctioneer Lynn Spell sold about 75 donated items, to help raise an additional $23,750 for the club. There was also a silent auction, and a card draws for a shotgun and a TV. In addition, a number of local businesses contributed as sponsors to the event. Major sponsors included Dependable Diesel, Eddie and Cathy Frautschi, Sterling White Funeral Home, Jeff Moore, Jerry and Julie Fallin, Charlies Ice House, Charlie Ward, Community Toyota Honda Kia, Roger Elswick, Megasand Enterprises, Brenda Moore, Basic Equipment, Amegy Bank, Tom Hill, Churck & Carol Radney, Oilwell Tubular Consultants, Rosenkranz State Farm, Jeremy Rosenkranz, Texas Citizens Bank, Teresa Martin, Joe Stelphens, Jr., Robert Woodall Enterprises, Porter Truck Sales, Central Auto Inspections, Johnny Gaeke, Griffith Truck and Equipment, Bruce Griffith, Certi-Fab Industries, Woodforest National Bank, United Community Credit Union, Capital Bank, Allegiance Bank, Ignacio Pujol, Jr., Harris County Insurance Center, Murff Turf. The Chili Feast is in its 40th year, the first year being 1976. The first raffle for an automobile was held in 1983, with Gladys Burton winning a 1983 Cadillac.